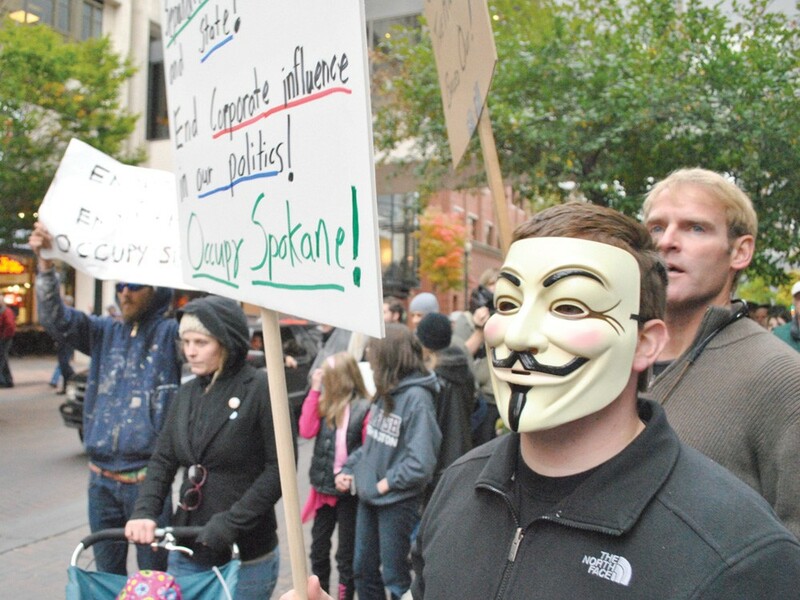 Two marches over the weekend brought hundreds out in the streets, including some sporting Guy Fawkes masks. On a sunny Tuesday afternoon, Occupy Spokane was just a few people with signs who would throw up fists and wave when a horn sounded from passing Monroe Street traffic. But then on Friday last week, the median in front of the Spokane Club was packed, to the point that getting through the masses before cars came roaring down Riverside was a challenge. Someone had called a march. Labeled the March for Peace, Friday afternoon’s event started with speeches delivered from atop a table. The speakers stood nearly as tall as the Monaghan statue looming over the median. Those who took to the table presented views as diverse as the demands of the Occupy movement itself, which began in September with the Occupy Wall Street protest in New York City’s financial district and continues to this day. Pastor Happy Watkins, known locally for his rendition of MLK’s “I Have a Dream” speech, railed against the number of incarcerated black men he saw when visiting a local prison. Democratic Washington State Rep. Timm Ormsby hopped up and told everyone that he was a politician, like it was a dirty little secret. He then told the crowd, estimated at about 300 people, that they had his attention. The people in the crowd supported a variety of things, and Friday’s signs reflected that: “Bankers winning, taxpayers losing.” Or, “I will believe corporations are people when Texas executes one.” One person went around with a sign saying “End the Fed,” a sentiment championed by Ron Paul, a Republican congressman from Texas. Another popular person was Guy Fawkes. He’s long dead, but the mask symbolizing his attempt to blow up the British House of Lords back in 1605 is not. “I believe it’s fairly symbolic of what we’re trying to accomplish here,” says Josh VanVeen, whose Fawkes mask was resting on top of his head. But did VanVeen, 29, advocate the use of gunpowder to bring about change? The Occupy movement is spreading. Locally, the occupation has moved to Coeur d’Alene — and rumors of an Occupy Cheney are circulating. Almost every major city in America is occupied. Europeans have taken to the movement as well, with varying effects. Globally, the shadow of a police crackdown looms over the movement, particularly after police in several American cities have evicted encampments they say are there illegally. But with the peaceful marching here — protesters used sidewalks and waited at red lights — local police have kept a minimal, almost imperceptible, presence. “We’ve found them to be quite organized and pretty deliberate to be within the confines of the law, which is great because they are able to get their message out,” says Marlene Feist, the city’s spokeswoman. Case in point: No police showed up at the Friday protest since there didn’t seem to be much need for them, Feist says, adding that there were enough police around the downtown area that they could show up fast if called to respond. The one beef between the protesters and the city that has developed was with a portable kitchen set up by Hippie Family Ministries at Spokane Falls Boulevard and Monroe. The tent is on Spokane Public Library property and needs a permit, says the library’s director, Pat Partovi. She wanted them out by the end of last Saturday. Then Monday rolled around and they were still there. The city and the protesters had negotiated a 14-day permit under the transient shelter ordinance that could be renewed one time for another 14 days. Reflecting on Friday’s demonstration, Ormsby says the cry of the 99 percent may represent the centerpiece of the Occupy movement’s philosophy.